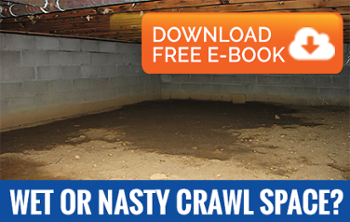 Crawl space encapsulation is a major undertaking and will require a professional. If you live in St. Louis or a neighboring community, you can trust AdvantaClean because we have all the tools and equipment needed for this job. We're part of a national brand, and we follow the same high standards for work that our brand has developed over its more than 20-year history. Crawl spaces are notorious for their high humidity levels and also tend to be places where water can easily condense. Vapor rise from the soil and sweating pipes are just two possible factors. With the condensation of water, your chances are higher that mold and mildew will grow in the area. These fungi thrive in dark, dank, enclosed spaces and require humidity levels of 70% or more as well as the presence of organic matter to serve as food: conditions easily met in a crawl space. Mold is an especially deadly fungus; exposure can lead to flu-like symptoms and, in severe cases, neurological conditions. Even if you don't go down to the crawl space, the moldy air will rise when it's warm, affecting the indoor air quality of your entire property. Mold will also contribute to dry rot, which in turn will attract termites and other pests. We know that crawl space vents are widespread in this area, and we also know that many homeowners think these are sufficient for keeping moisture levels down. The fact is that vents are only good in dry climates; in humid climates, they actually increase moisture levels. One of the simplest solutions is to install a crawl space dehumidifier. This is usually something we run after a flood or plumbing disaster, but it can effectively prevent mold growth and other issues. We'll make adjustments so that it turns on only when humidity levels exceed 70% (though we might recommend a different limit). A downside to the crawl space dehumidifier is that it will become a continual expense. This is why crawl space encapsulation may be the better choice. Since the important thing is to keep water from condensing on your walls and floor, what we'll do is lay down a thick plastic membrane, called a crawl space vapor barrier, over these surfaces. Let our team handle the installation from start to finish. We'll carefully tape up the seams, and we'll install a drain so that any moisture that develops behind the barrier will be removed. The barrier will, of course, cover up any crawl space vents; this should drastically bring humidity levels down in this area. For even greater results, you can ask about having insulation put in. To ask any questions about our crawl space vapor barriers and dehumidifiers, give us a call today. AdvantaClean is proud to keep customers' homes and businesses free of mold and other dangers in the St. Louis / St Charles and surrounding areas.